Gentlemen (and ladies, and kids), start your engines. The 2014 gardening season has begun, here on the farmden, at least. The day began with my lugging the big pail of potting soil from the cold garage to a warm spot near the woodstove. 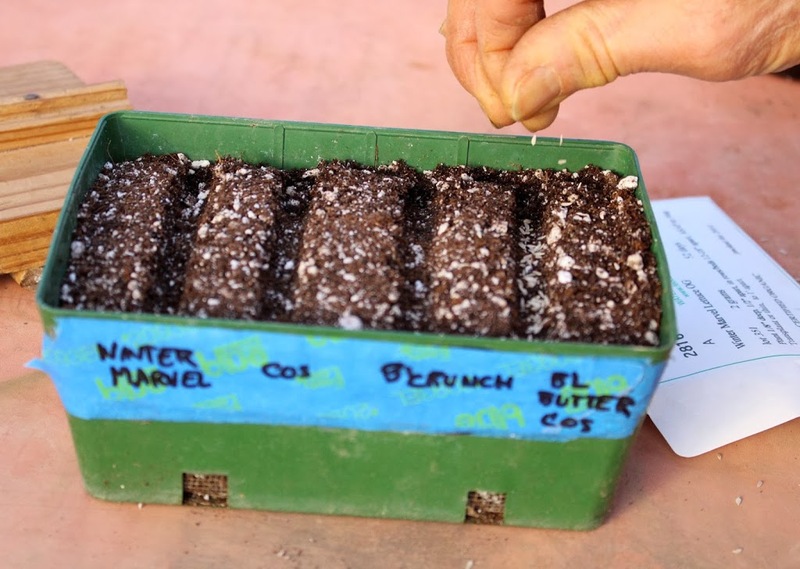 My home-made potting soil — equal parts peat, compost, garden soil, and perlite, with some soybean meal thrown in — is moist when I make it, so was frozen solid. Not usable or suitable for germinating seeds. 1/4-inch dowels glued to its underbelly, creates a miniature farm field. Into the tub’s “field” go rows of fresh onion and leek seeds (fresh is important with these seeds, which lose viability after a year or two), about 7 seeds per inch, which is enough to well populate the “field” without causing crowding. After the seeds are covered with soil and gently and thoroughly watered, the tub gets covered with a pane of glass and placed on a heating mat that provides gentle warmth of between 70 and 80 degrees F.
16 hour days. The plants shift gears and redirect their energy into pumping up growing bulbs. More leaves at that time means more stored energy available to swell up sweet, juicy bulbs. That’s what I want and why I go through the trouble(?) of early, indoor sowing. I’ll plant out the seedlings in early May. 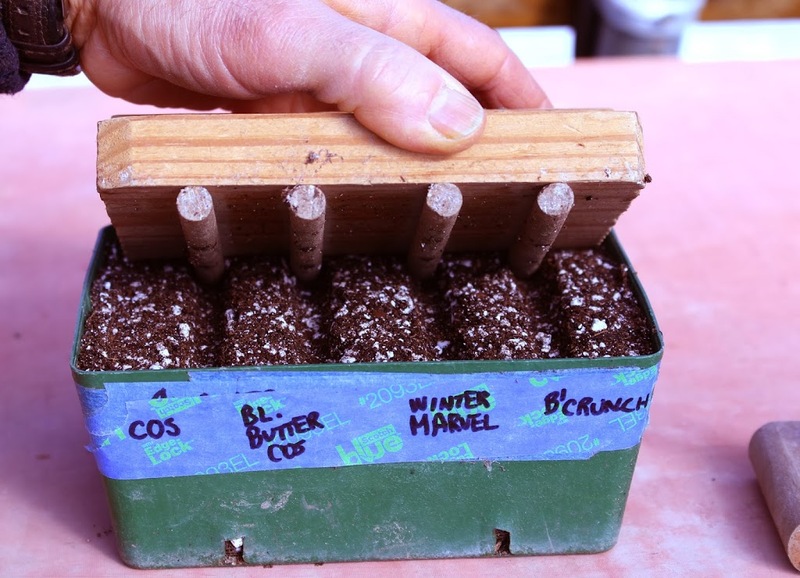 The small seed flat gets similarly filled with potting soil and sown with seeds, lettuce seeds in this case. Greenhouse lettuce is still going strong but I want to have some transplants ready for when the older stuff peters out. A 4 by 6 inch flat with four furrows of lettuce seeds should provide all the lettuce transplants I need for many weeks. A greenhouse full of only lettuce could get boring. 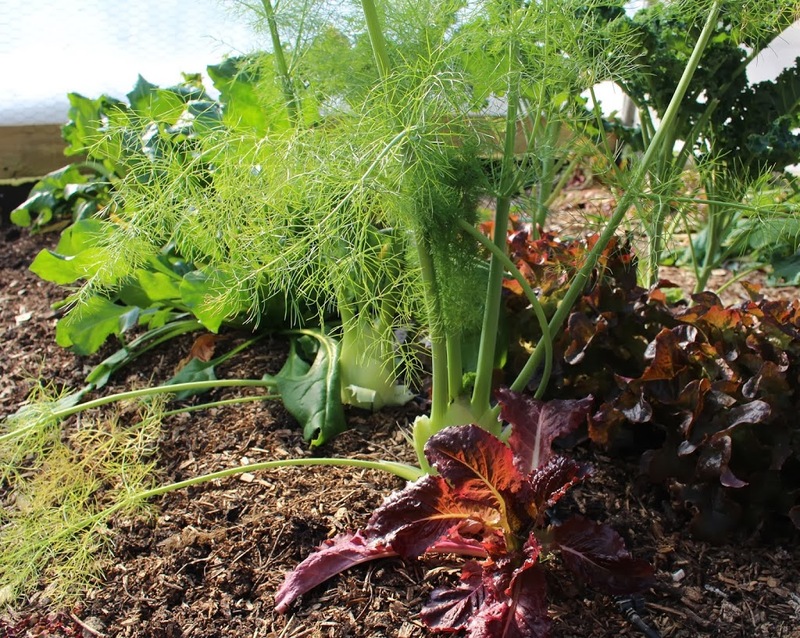 Other sorts of edible greenery currently share the space, and will continue to do so in the coming weeks. Some has been planted, and some has planted itself. necessitated transplanting self-sown mâche from outdoor garden beds into the greenhouse last September. 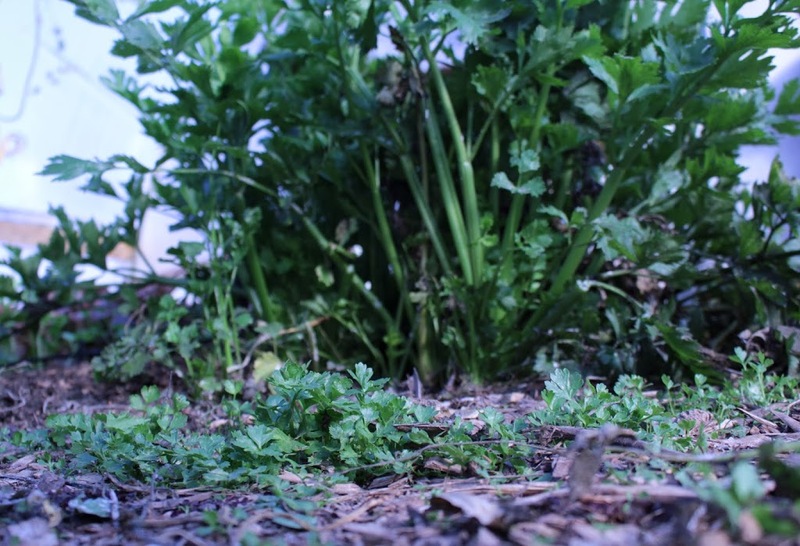 Self-sown greenery includes claytonia (miner’s lettuce), minutina, and — more familiar to most people — celery. Claytonia doesn’t have much flavor but adds texture and color to a winter salad. The same goes for minutina, which is actually an edible species of plantain (the common lawn weed, not the banana relative). Celery plants are in various stages of growth. We’ve been eating the mature ones for months and the smallest seedlings will be ready for transplanting out into the garden in early May. of bread sitting innocently on the kitchen counter. Bob grabs a knife and already has a sandwich in mind. “Do you have any tomatoes,” he says. What? Tomatoes? It’s midwinter! I guess he’s made the link gardening-greenhouse-tomatoes. Never mind winter. Sorry, not in my greenhouse in winter, for a few reasons. Fruiting demands a lot of a plant’s energy. That energy comes from the sunlight. Even though the sun has been rising higher in the sky and for longer periods daily, its light is still paltry compared to midsummer sunlight. A bright summer day bathes the garden with about 10,000 foot-candles of light. My greenhouse, according to measurements taken at high noon on this crystal clear day, is bathed with about 6,400 foot-candles of sunlight. Natural sunlight could be supplemented with artificial light. Not a table lamp or even a bank of fluorescents, though. Light intensity falls off as the inverse square of distance from the light source; double the distance and you’ve got only one-quarter the intensity. So plants need to be close to the light source, which then will shade natural sunlight. Special high intensity bulbs are needed to make a dent in winter’s relative darkness. And then there’s the temperature needed to raise a crop of tomatoes in February. For tomatoes, I wouldn’t want temperatures lower than in the 50s. My greenhouse heater kicks on at 37°F. Each degree of warming increases heating costs about three percent. Winter tomatoes don’t seem worth the extra cost in dollars and to the environment from increased usage of gas or electricity. And they don’t taste that good. I can wait. This entry was posted in Uncategorized and tagged fennel, kale, lettuce, potting soil, seedlings, tomatoes, transplants. Bookmark the permalink. Trackbacks are closed, but you can post a comment. I’m jealous of your friend Bob since I wish we were neighbors so I could come learn from you.